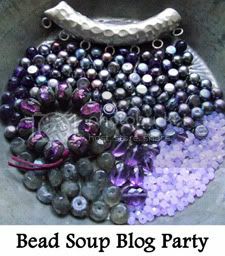 I am so excited to be a participant in Lori Anderson's Bead Soup Blog Party! I followed the last party and had so much fun that I decided I had to play this time. She has sign up for the party, and then pairs all of us up with a partner. We then send each other a fun "bead soup" which we then get to create a piece of jewelry from. The day of the party we share what we made! I just received my partner, her name is Laura Twiford, and her blog is Souvenirs From Life.. I love the vintage pieces she has created in her etsy store. I can't wait to put together a fun soup for her! Thank you Kari! I am looking forward to my first bead soup as well. I have spent this morning reading all of your posts to get to know you better. You have a lovely family and are a great Mom! Your lampwork is beautiful too!